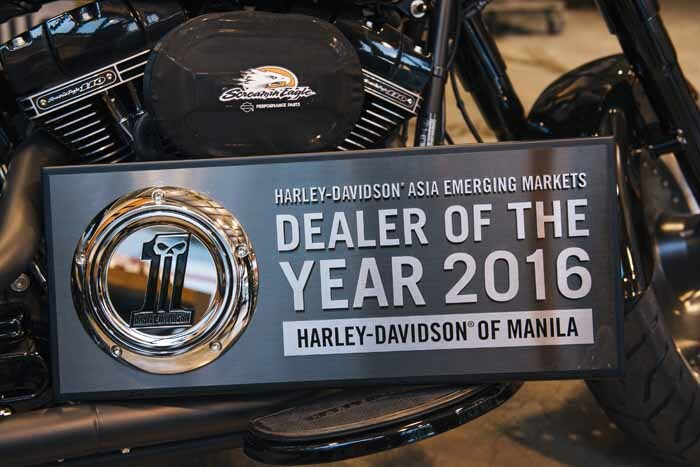 Harley-Davidson of Manila has been awarded the Harley-Davidson Asia Emerging Markets (AEM) Dealer of the Year 2016. The distinction was presented during the AEM Dealer Principal Meeting in Bangkok, Thailand. Harley-Davidson of Manila is the first authorized Harley-Davidson dealership in the Philippines to have earned this award. L-R: Art Tan (Director), Greg Yu (Chairman), Felix Ang (President), and Jay Bautista (General Manager) of the Harley-Davidson of Manila Team holding the Asia Emerging Markets Dealer of the Year 2016 award. Mr. Peter Mackenzie, Managing Director of Harley-Davidson AEM and China, together with Ms. Hee-Jung Moon, Dealer Development Manager,AEM, handed out a commemorative plaque with the Dark Custom™ number one logo emblazoned on a derby cover. There to receive the recognition was Mr. Francis Jonathan C. Ang, Vice President of American Motorcycles, Inc. and Mr. Jay Bautista, Harley-Davidson of Manila’s General Manager. The Harley-Davidson of Manila Team from its two dealership locations – BGC and Greenhills.